← Pic: St. Louis Cardinals website ‘moves’ team to NL WEST! The New York Yankees annual rookie hazing tradition took a musical turn Sunday night. Per ESPN’s Ian Begley, Joba Chamberlain created his own little ‘pop’ stars. 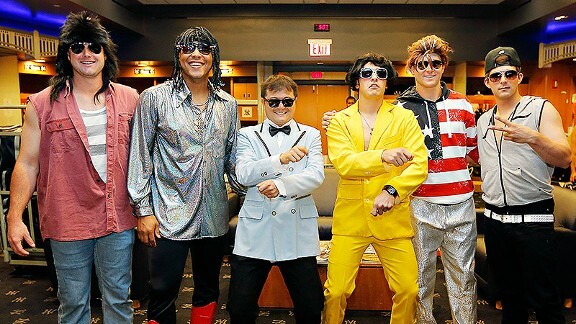 Pictured left to right: Preston Claiborne as Billy Ray Cyrus, Cesar Cabral as Rick James, interpreter Jiwon Bang as Psy, Brett Marshall as a “Gangnam Style’ dancer, David Adams as Vanilla Ice and, the ultimate humiliation, J.R. Murphy as Justin Bieber. This entry was posted in American League, Hazing, LOL, New York Yankees, Rookie and tagged Baseball, Billy Ray Cyrus, Cesar Cabral, David Adams, ESPN, Joba Chamberlain, JR Murphy, Justin Bieber, LOL, Major League Baseball, MLB, New York Yankees, Preston Claiborne, Rick James, Rookie Hazing, Vanilla Ice. Bookmark the permalink.